Opuntia pinkavae B.D.Parfitt, Rhodora 99(899): 223. 1998. 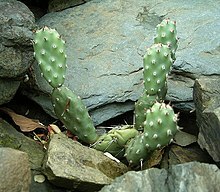 Opuntia basilaris var. woodburyi W.H.Earle, Saguaroland Bull. 34: 15, figs. 1980, nom. inval. Opuntia erinacea var. woodburyi (W.H.Earle) S.L.Welsh, Utah Fl., ed. 5. 83. 2015, comb. inval. 'eFloras 2008. Opuntia pinkavae in Flora of North America . Missouri Botanical Garden, St. Louis, MO & Harvard University Herbaria, Cambridge, MA. Parfitt, B.D. (1998) Rhodora 99 (899): 223. Shaw, J.J. & al. (ed.) 2015. Opuntia Web. Published on the internet. Accessed: 2015 Apr 25. This page was last edited on 15 April 2019, at 07:50.